May is Lyme Disease Awareness Month, a campaign that brings attention to this tick-borne illness. 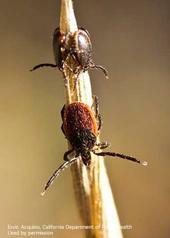 Lyme disease can be transmitted to humans and pets in California from the bite of an infected western blacklegged tick. Lyme disease causes flu-like symptoms that left untreated, may progress to arthritic, neurologic, or cardiac problems. Incidences of Lyme disease have occurred in some northern California counties, with some counties posing a higher risk of contracting the disease than others..
April 16-22 has been declared West Nile Virus and Mosquito Vector Control Awareness week by the California State Legislature. West Nile virus (WNV) is a mosquito-borne disease that was originally found in Africa. It was first detected in the eastern U.S. in 1999, and has since spread across the country and is well established in most states, including California. West Nile Virus is spread by mosquitoes that get the virus from infected birds. Once infected, mosquitoes then transfer the virus to humans and other animals. Infected humans can become very ill. The disease usually is most serious in children, people with weakened immune systems, and the elderly. May is Lyme Disease Awareness month, so what better time to tell you about the updated Pest Note: Lyme Disease in California. This updated publication, by authors Robert S. Lane and Anne Kjemtrup, contains new information on incidents of Lyme disease in California. How is Zika Transmitted? 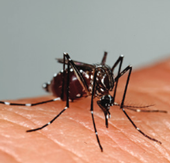 The Zika virus is primarily transmitted by the bite of an infected female Aedes egypti mosquito, a species also known to carry yellow fever. The Zika virus is thought to also be transmitted via blood transfusion and sexual contact, and in rare cases from mother to child. Researchers are currently investigating the link between the Zika virus and birth defects including microcephaly.